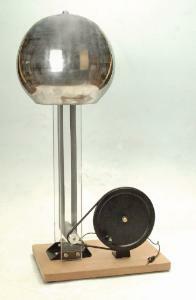 The Hand-Cranked Van de Graaff Generator demonstrates the conversion of mechanical energy into electrical energy by generating a static charge. Generator Size: 15 cm dia. Discharging Sphere Size: 10 cm dia. This simple generator uses man power instead of electricity. Adhesion between the belt and the lower pulley charges the pulley, and it attracts opposite charges to the outer surface of the belt from the grounded comb. The belt then transports these charges to the terminal where they are collected by the upper comb. The shielding provided by the terminal allows the process to continue even if the terminal is already strongly charged. The high speed of the belt, along with the large discharge electrode, allows the continuous buildup of charges and great voltages to be achieved.